This is my fourth game, and this time the decisions are all you all the time. Friends will try to get you to pick good things that will happen to you, while sabotaging each other before you choose by playing problems on each other. I am very excited about this game. It might be the most me game I have made. Which is all the warning you are going to get. Want to make the game dirtier? Get the red expansion and shuffle it into the game. Want to make it geekier? Get the orange expansion. All of my games are customizable to fit whatever you and your friends are into. Well, almost. Not that one thing that made Katie leave you. PARTY TIME: This game has been designed to be fun and funny for all kinds of people in groups of 3 to 10 (or more). 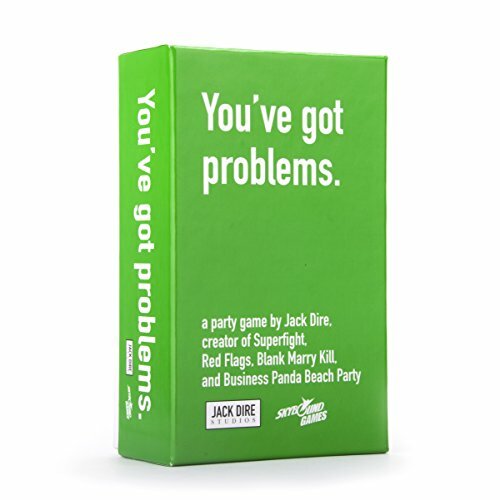 You've Got Problems is great for parties and game nights with big crowds. Let the party begin! FUN WITH FAMILY & FRIENDS: What could be more fun than spending a Saturday night with a group of friends or family, some pizza and a few glasses of wine accompanied by a box full of "problems"? Not many things will ensure a night of laughter and fun like an adult game night with You've Got Problems. Give it a try! EXPANSION PACKS: Spice things up with our two expansion packs! Want to make the game dirtier? Get the red expansion, You've Got Dirty Problems. Want to make it geekier? Get the orange expansion, You've Got Geeky Problems, and shuffle into the game! All of our games are customizable to fit whatever you and your friends are into... Well, almost. ENDLESS FUN: This fun and enjoyable game will have your party going til the wee hours of the night. Party size and stamina always vary, so play until you don't want to play anymore, then count up the points! If you have any questions about this product by Jack Dire Studios, contact us by completing and submitting the form below. If you are looking for a specif part number, please include it with your message.